For a bit of traditional style in your bathroom, choose this beautiful vanity. This piece comes with a beautiful brown solid wood base and a beige tan marble counter. This set from Wyndham Collection is great for anyone looking for great style and function in their bathroom. Sheffield 48-inch W 3-Drawer 4-Door Vanity in Brown With Marble Top in Beige Tan With Mirror For a bit of traditional style in your bathroom, choose this beautiful vanity. This piece comes with a beautiful brown solid wood base and a beige tan marble counter. This set from Wyndham Collection is great for anyone looking for great style and function in their bathroom. 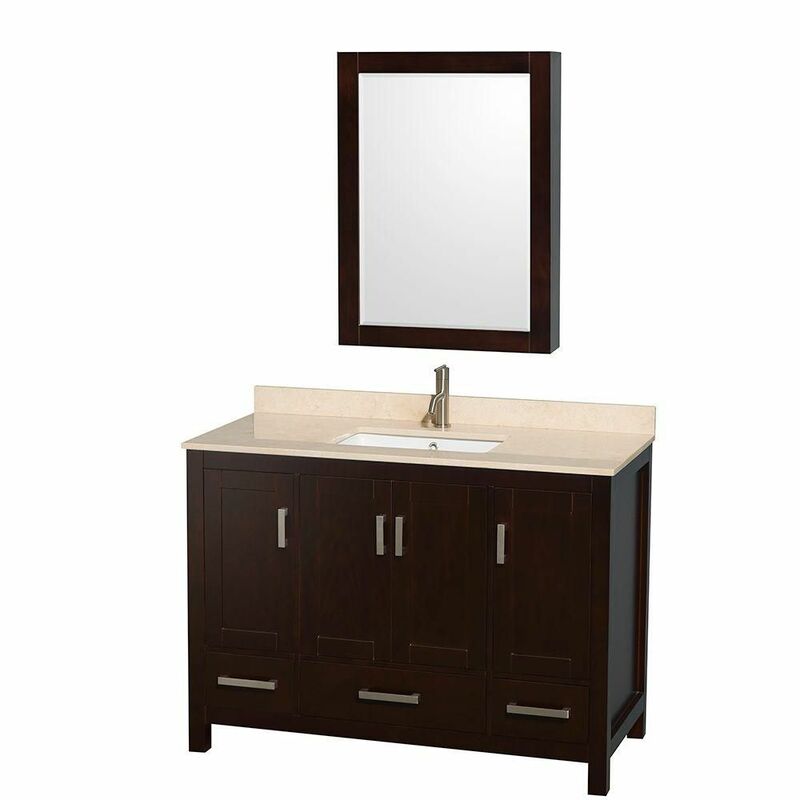 Sheffield 48-inch W 3-Drawer 4-Door Vanity in Brown With Marble Top in Beige Tan With Mirror is rated 5.0 out of 5 by 2. Rated 5 out of 5 by Anonymous from Great Looking Vanit Arrived into Home Depot store with a dent in the side. Negotiated a discount. Put the toilet paper holder over it so don't see the dent. The rectangular wash basin seems big and needs a little extra water to wash down debris that remains in the corners. Wish it were steeper towards the drain. It's not flat, but could be steeper. Purchased from a local store a separate mirror that spans the width of the vanity. Much better than the little mirror available for this vanity. Had a contractor assemble it, which went easily enough. Wish it had more shelving space. So, I purchased some similar colored wood boards from Home Depot and cut them to a size that fits as shelves in the side cabinets. Will make another pair of shelves to run down the of the main center cabinet.